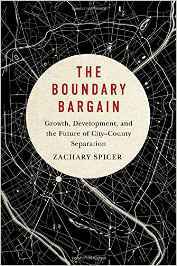 For my birthday I was finally able to finish up Zachary Spicer book The Boundary Bargain. The book outlines the evolution and nature of the cities and rural areas in Ontario and the consequences of this divide. Providing a historical overview dating back to the early cities of Upper Canada to outline the evolution of how towns grew into cities and how they interacted with the rural countries that surrounded them; Spicer set the contextual stage for many of modern challenges of sprawl and inter-governmental cooperation. To illustrate these challenges Spicer uses three case studies: London-Middlesex; Guelph-Wellington County and Barrie/Orillia-Simcoe County to illustrate the ongoing tension between urban centres and their surrounding rural partners. Each of these City/Counties face their own unique challenges: from London where suburbanization is being driven by county representatives along city’s fringes, which has led to the City refusing to provide services and to talk of annexation. To Guelph where a cooperative arrangement has been put in place to allow Guelph to expand as needed but questions of whether appropriate intensification will occur. To the Simcoe County where Barrie and Orillia are separated cities on different trajectories with Barrie being the fastest growing cities in Canada and Orillia growing at a negligible rate; within the rest of the County you find that it is split between rapidly growing suburban communities closer to the GTA and slower growing northern communities that struggle to maintain their economic base. Spicer concludes by looking at the institutional mechanism that can potentially overcome the artificial boundaries that exist between cities and their surrounding counties. Providing examples from the “New Regionalist” paradigm he examines the feasibility of potential institutional solutions to these boundary issues which range from: basic inter-departmental cooperation to department amalgamation across a region to the formation of single tiers of government. Overall this book does a wonderful job at illustrating the institutional challenges that face many cities and counties across Ontario. With thirteen separated cities/counties remaining in Ontario, Windsor-Essex, being one of them; the book provide insights on how our region (and others) could potentially move forward to improve cooperation and coordination. My only hope is that Spicer doesn’t spend too much time taking a closer look at the dysfunction state that is Windsor-Essex, as it will take away a lot of potential the material from this blog. I think the most important part of improving relationship between Windsor-Essex is to dedicate to having regular semi-annual meetings, to prevent flareups that make the relationship between City and County appear worse than it actually is.